Educational and Play Panels, Rainbow Bridge. Technicians: Our installation team can do the supervision and installation for your playground. The decorations can be very nice. Remark: We can custom design your playground upon the floor plan of your site. 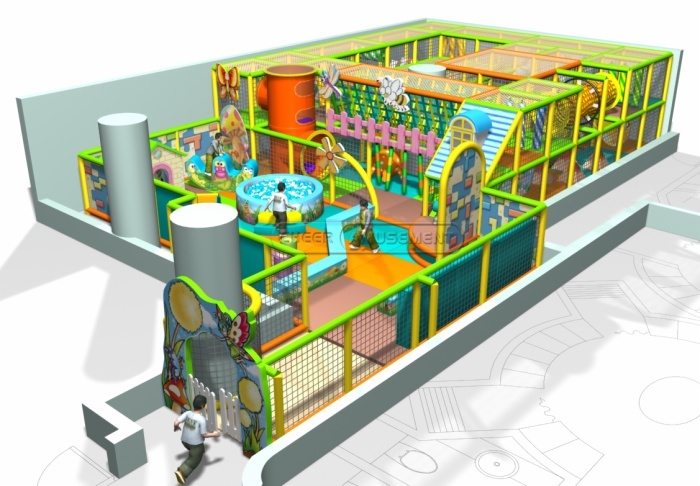 Components Web Crawl, Ball Pool with Slide, Adventure Bridge, Tube Climbing, Educational and Play Panels, Rainbow Bridge. Material Galvanized steel pipe, PVC Vinyl, foam, Safety Netting, EVA mats, Plastics and etc. Technicians Our installation team can do the supervision and installation for your playground. The decorations can be very nice. 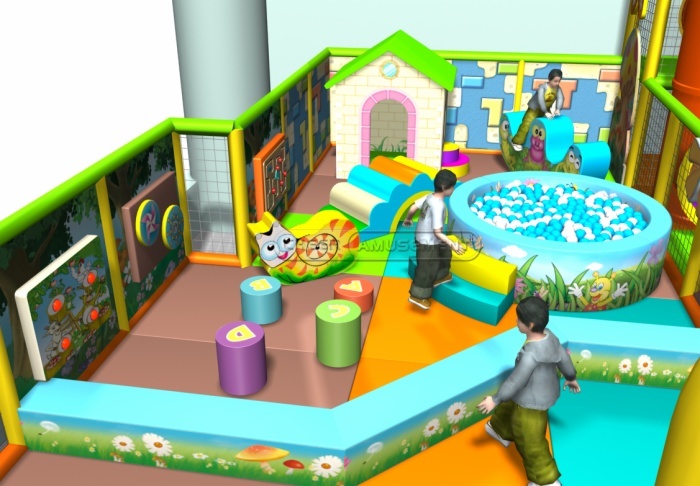 This playground is suitable for most of the play centers, shopping malls. 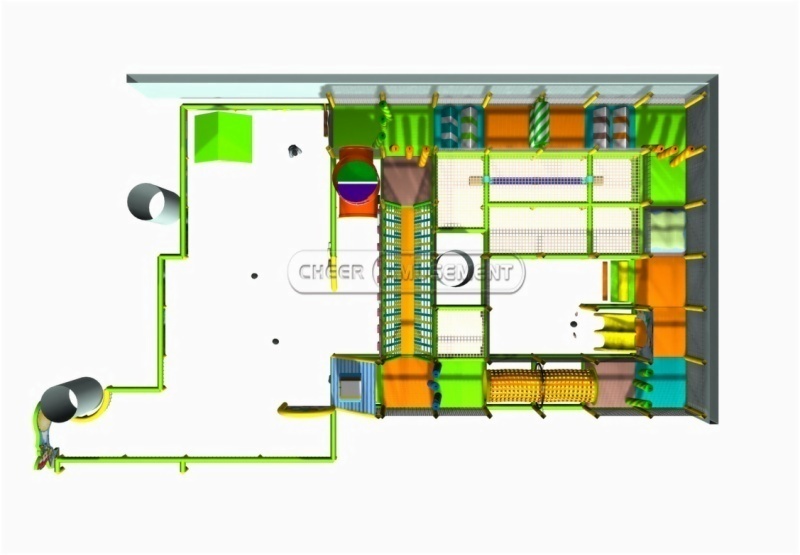 The size is with the longest part of 12.2meters, 7.32meters width, the highest 2.5meters. 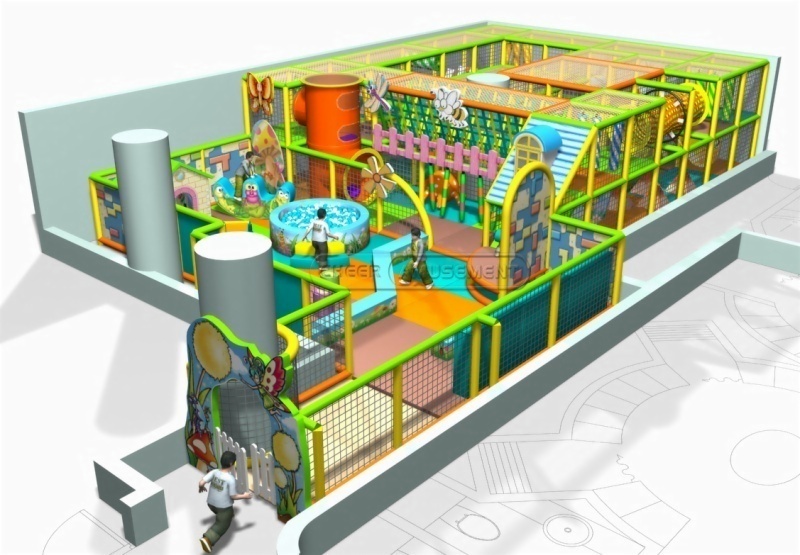 The amusement area contains various entertainment activities - Web Crawl, Ball Pool with Slide, Adventure Bridge, Tube Climbing, Educational and Play Panels, Rainbow Bridge. 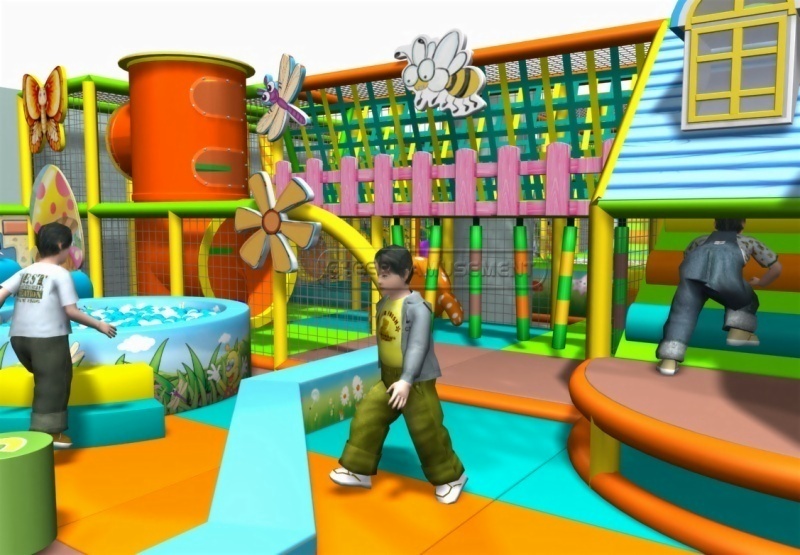 - This play area can satisfy 0-12 years old children climb, jump, crawl, run, throw activities requirements. 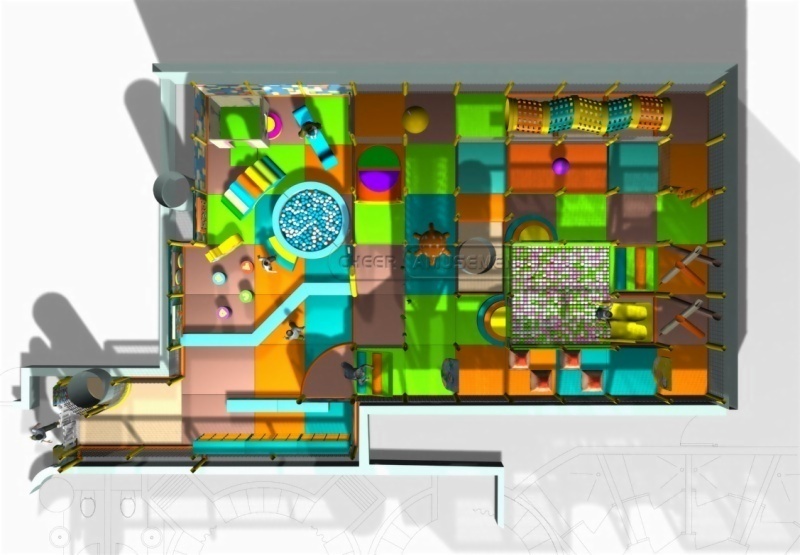 And the whole area can hold 50-80 children with activities also does not appear crowded, children can invite partners play together, increase the kid's interaction and communication skills for children to provide more fun. Parents can supervise their kids when they are playing, as well as accompanying kids to play in it. The most major characteristic of this playground is space flexibility，and open area filled with lot’s of interactive play events. 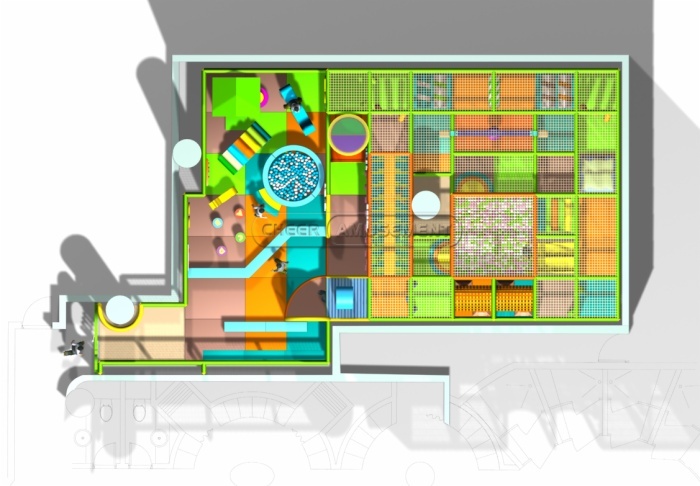 The area with 100 square meters can adapt to most of the indoor play centers, shopping malls，and etc. Smooth simple equipment are more likely to operation and dismantling. As for the dealer, the product is more potential customers, the market space is large; It will be easy for the new users to operate, and can be used for a long time, the average use for five years. It can even be using more than 5 years with good maintenance daily and yearly. This product subject is the software, the products are smooth, material are superior, some of the materials are imported, all of the edge, angle, edges have been grinding processing, and outside with the software products to do the second packing, greatly enhance the safety of products, the main raw materials we use are the finest, Galvanized steel pipe, PVC Vinyl, foam, Safety Netting, EVA mats, Plastics and etc.. In the operation,please prevent kids taking some sharp tools. Please also pay attention to cleaning the playground and maintenance in a regulated time.